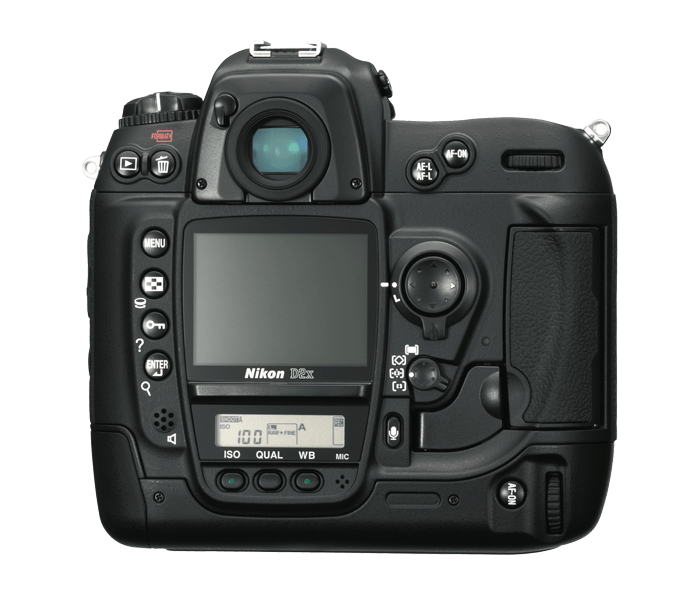 12.4 Effective Megapixels: High Resolution 12.4 Effective Megapixel CMOS DX Sensor with fast 4-channel output for 4,288 x 2,848-pixel images. Exposure Control: Programmed Auto with Flexible Program [P], Shutter-Priority Auto [S], Aperture-Priority Auto [A], Manual [M]; Exposure compensated in 5.0 EV range in 1/3, 1/2 or 1 EV steps; Auto Exposure bracketing; Number of shots: 2 to 9 frames Compensation steps: 1/3, 1/2, 2/3, or 1 EV steps; Continuous shooting mode: Provides an amazing 5 frames per second continuous shooting at full resolution, for 21 JPEG or 15 NEF images. Wireless: WT-2A Wi-Fi transmitter (optional) Wireless connectivity using 802.11g technology is possible through this accessory with full remote camera control using new Nikon Capture 4.2 software for unparalleled creative remote and unattended photography; Top shutter speed: 1/8,000 sec. Improved 3D Color Matrix Metering II with more refined exposure evaluation algorithms and larger database for difficult-to-meter scenes. TTL full-aperture exposure metering system: 1) D-/G-type Nikkor lenses support 3D-Color Matrix Metering II using the 1,005-pixel RGB sensor while other AF Nikkor lenses with built-in CPUs support Matrix Metering (Non-CPU lenses require manual input of lens data); 2) Center-Weighted Metering (75% of the meter's sensitivity concentrated on the 8mm dia. circle) given to 6,10 or 13mm dia. circle in center of frame, or weighting based on average of entire frame; 3) Spot Metering (3mm dia. circle, approx. 2% of entire frame); Metering position can be linked to the focus area when using Nikkor lenses with built-in CPU. Compatible with the Coolwalker Digital Storage Photo Viewer: Store up to 10,000 digital photos on the 30GB hard drive and view them on the high-quality 2.5 inch TFT color monitor. Stores JPEG, TIFF and other major image file formats, including NEF files. Compatible Lenses: AF Nikkor (including AF-S, DX, VR and D-/G-type): All functions possible; D-type Manual-Focus Nikkor: All functions except autofocus and some exposure modes available; AF Nikkor other than D-/G-type: All functions except 3D Color Matrix Metering II and 3D Multi-Sensor Balanced Fill-Flash possible; AI-P Nikkor: All functions except 3D Color Matrix Metering II, 3D Multi-Sensor Balanced Fill-Flash and AF possible; Non-CPU AI Nikkor: Usable in [A] or [M] mode with Matrix-Metering, Center-Weighted and Spot metering available. Indication of aperture number after user inputs the aperture f/stop and focal length f=mm by multi-selector operation. Electronic Rangefinder usable with maximum aperture of f/5.6 or faster. Flash: Nikon Creative Lighting System support for Nikon Speedlights SB-800, SB-600 for full i-TTL flash control with Nikon Advanced Wireless Lighting, color control, FP High-Speed Sync, Modeling flash and more! Autofocus: Multi-CAM 2000 Autofocus system provides 11-area autofocus system with group dynamic AF, close-subject priority dynamic AF, close subject in a group priority dynamic AF and Lock-On(TM) for various methods of following the fastest action. In the Box - Supplied Accessories: Type-B Focusing Screen, Rechargeable Li-ion Battery EN-EL4, Quick Charger MH-21, Body Cap, Camera Strap AN-D2X, Audio Video Cable EG-D2, USB Cable UC-E4, LCD Monitor Cover BM-3, Battery Chamber Cover BL-1, PictureProject software CD-ROM; Supplied accessories may differ by country or region.